Fulfilling what he has called a "grave responsibility," Pope Francis has often addressed the issue of economic inequality and the use of personal, corporate, and national wealth. Francis's teaching is rooted in the teaching of Jesus, preserved in the pages of the New Testament. The Bible has more to say about the use of wealth than it does about other moral issues of our day, yet this teaching seldom enters into the conscience of believers. 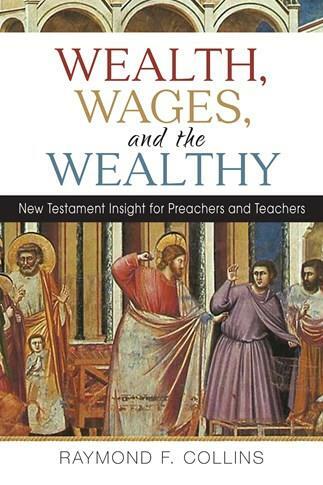 In Wealth, Wages, and the Wealthy: New Testament Insight for Preachers and Teachers Fr. Raymond F. Collins redresses this issue and provides the reader with a careful examination not only of what Jesus said about wealth but also of what each of the New Testament authors wrote about the topic. Raymond F. Collins is a Roman Catholic priest and a New Testament scholar. Most of his academic career was spent at the Catholic University of Leuven in Belgium, the world's oldest Catholic university, and at The Catholic University of America in Washington, DC, where he taught and served as the dean of the School of Religious Studies. Among his twenty books are major commentaries on Paul's First and Second Letters to the Corinthians and the Pastoral Epistles, 1 and 2 Timothy and Titus. "A healthy guide in the struggle against poverty on the journey of Christian faithfulness. A wise and insightful reminder of the many things the New Testament has to say about wealth, wages, and the wealthy." "Collins's book will definitely benefit pastors and preachers as it provides core information on the texts selected and insightful reflections on contemporary issues relating to them. With synthetic views offered in the last chapter, Collins addresses and challenges the issues of economic injustice both in the NT era and today." "Ray Collins has favored us with a careful examination of what the Bible has to share with us from God's heart about money. Wealth, Wages, and the Wealthy is a steady, practical, and inspiring reply to any who would barricade money and its uses and misuses from things spiritual, and a hearty support for Pope Francis's dream for Christians worldwide." "Highly recommended. Bishops should make is a Christmas gift to all priests." "With candor and brilliance, Ray Collins offers a rigorous study of the New Testament to bring to the fore one of the most pressing issues affecting the common good in the ancient world and today: economic justice. Collins challenges contemporary preachers and leaders to address poverty, wage manipulation, and the misuse of the judicial system, and he has provided the needed information and basis for them to do so. Would that our Sunday sermons and legislation now ring loudly with the prophetic spirit!" "Collins has opened doors in the Scriptures that reveal texts that are rarely explored, and even more rarely, explored fully and together. Yet these texts are central to Jesus' teachings. Living as we do in a culture dominated by greed, it is countercultural to be consistently generous, and, even more so, to be radically generous, but that is precisely the lifestyle to which the Gospel calls us. Collins presents each of these texts, explains their meaning in the historical context in which they were first produced, and briefly, at the end of each chapter, exposes our deafness. The Gospel has the power to transform us, and Collins' exegetical study can help to facilitate that transformation. Every Roman Catholic, every Christian, should read this book." "The final chapter alone in Ray Collins's latest book, Wealth, Wages, and the Wealthy, is worth the price of the entire book. But, if you read only the final chapter, you will miss the careful and very accessible scholarship that leads him to conclude that Jesus' teaching and early Christian practice challenge, even condemn, the present economic order of the West, and of the United States in particular, because it oppresses the poor and those on the margins of society, leaving them with no access to justice or to hope. Every pastor needs to have this in his or her library. It will also be of great use in the undergraduate classroom in courses that deal with the practice of Christian morality." "Collins titles the last section of every chapter `So What?' In each of these he contrasts the core of the passages he just covered with stories of greed or hoarding wealth take from regular news services and quotations from the writings and homilies of Pope Francis. The point here is not simply the relevance of the `good news' found in the New Testament but also the observation of how little we hear these passages being quoted and explained in preaching and teaching. I hope that this book will find its way into the hands of those who need to hear, and proclaim, it's message." "Collins's writing is absorbing, penetrating, and accessible. In reading Collins's book, this reviewer felt a window opening on life during the emergence of Christianity and wonderment at just how much there is in these early texts on the concept of money." "This book is well-researched with explanations from New Testament texts using clear theological language. Excellent for a study group or an undergraduate course in social ethics." "The bulk of this book is careful exegesis of Scripture passages that can inform a preacher. The final chapter draws practical conclusions and applications from the exegesis. A parish finance or development committee would be well-served by this chapter alone." "An excellent and timely pastoral resource." "This book is a rich resource for `preachers and teachers'—in other words, all thoughtful Catholics and Christians—who recognize the gap between the treatment of wealth in the New Testament and most modern-day Christians' view of it. Ray Collins exposes the consistent theme found in texts referencing economics with writing that is accessible and contemporary. Ample footnotes and indexes provide direction for readers who want to dive deeper into the topic."